How sweet is Shadow? 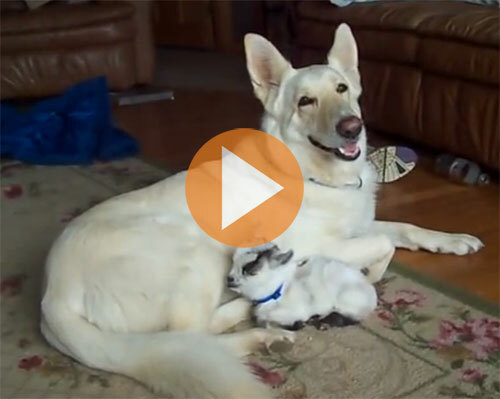 Watch as this lovely white German Shepherd Dog gently cuddles this newborn Pygmy goat kid as if it was her own puppy. What a good girl! This week’s goat videos feature a couple of sweet, very patient ponies (after last week’s with a patient dog). 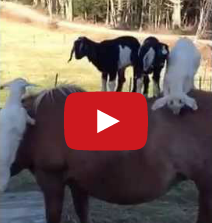 In the first video, Chanel the pony just lets these adorable baby goats dance around on her back. Goats just need to climb and don’t seem to mind falling and getting back up again — it’s a good thing they have hard little heads. Much like Chanel, Stella the pony also just stands quietly while a goat kid takes a ride on her back. 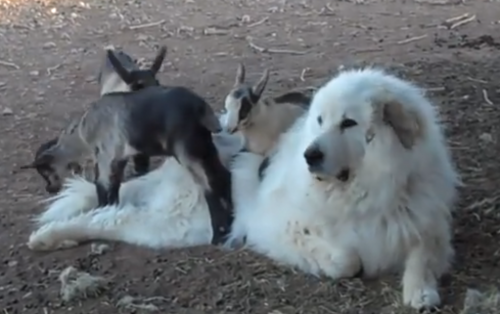 Today’s goat video is an “awwwwww” moment, brought to you by the sweet and gentle nature of guardian dogs, this one a Great Pyrenees named Cholla.